A CSA, which stands for Community Supported Agriculture, is the term that small-scale and organic farmers have come to use for a season-long subscription to a weekly share of what a farm produces. 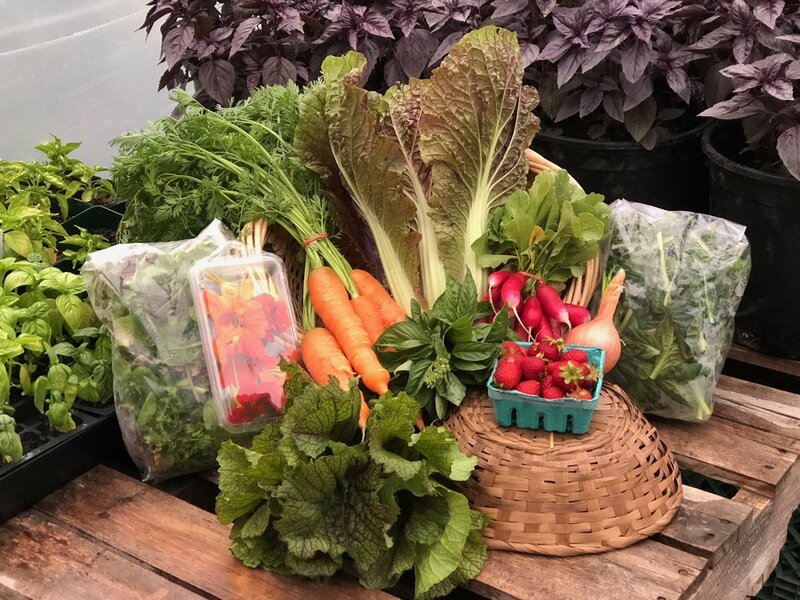 In exchange for a one-time prepayment, every week the farm provides you with a bag of perfectly ripe, hand-selected, organically grown fruits and vegetables. Your upfront payment helps us budget our expenses for the season, and in exchange, we work to provide you more value for your money over the course of the season. With a CSA membership, you are more than just another customer, exchanging dollars for anonymous food. You become a vital part of the farm's operation. You can get to know the farmers and, if you like, visit the farm. Every week we will send a newsletter with information about what is in the week's share, news and info from the farm, and recipes and ideas for using the food in your basket. You will experience varieties of vegetables not available in your supermarket grocery store - some that you may not recognize. Many varieties are heirloom types that have developed over the years and are grown for taste - not for how well they travel in a truck to the store. 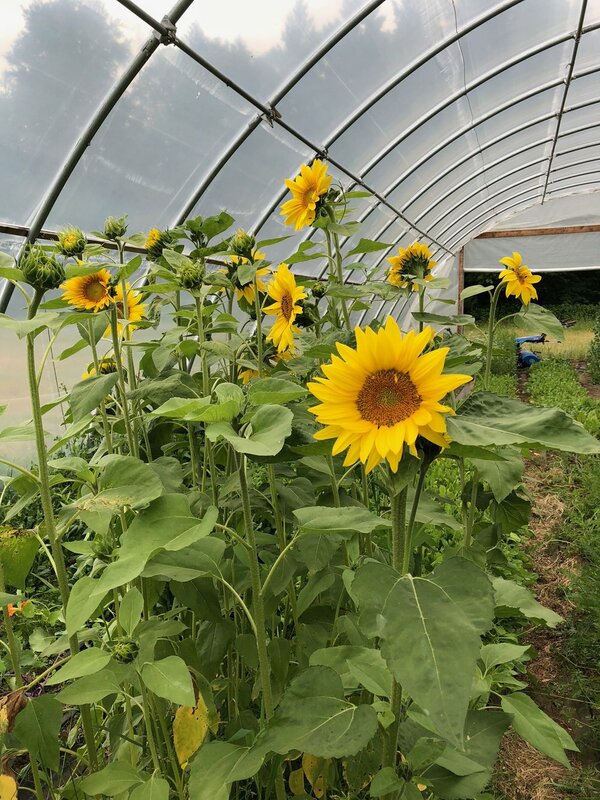 Most of all, you will experience the exceptional flavor and health benefits of a the freshest possible food, grown with intention and care by a team of dedicated farmers on a solar-powered, certified organic, local farm. The CSA will provide you a variety of seasonal fresh vegetables each week for 20 weeks from the beginning of June through mid-October. We offer one size share of 6-8 items. You can expect to find old-standbys (what would summer be without tomatoes and basil?) and new favorites (shishitos, anyone?) in your share, but the best part is that we grow varieties that you won’t find in the local grocery store and we pick the vegetables for you at the peak of their season. As members of the CSA, the farm gate is always open to you -- just give us a call! You can also sign up for an egg add-on: a dozen for organic, pasture-raised eggs. Eggs will be delivered with your CSA share during the season. If you are interested in eggs during the rest of the year, leave a note in the comment section and we’ll see what how we can make it happen. Thanks! Why Would I Join a CSA? What's in a CSA basket? Due to our harvest schedule and limited farm labor, adjustments to deliveries are difficult to accommodate. If you do have to skip a week, we suggest sending a friend to pick-up the share in your place - what better gift than a bag full of delicious farm-fresh vegetables? If this is not possible, we can take your share to a local food bank after market day with our extra produce.